Our trip to Lake Titicaca begins with the pickup from your hotel in Puno to go to the port of Puno where we board the boat that took us to the amazing floating islands of the Uros. 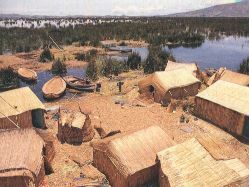 It is said that Uros have inhabited these islands for hundreds of years, people of the Uros know how to remove the abundant existing cane reed and put it together in large quantities and then putting them together to form small islands and platforms so that these ancient inhabitants despite the weather today remain living in artificial islands of reeds, known as the Water Tribe, they have to build their own islands regularly, adding new layers of "Totora." Their homes and boats are made from this material. 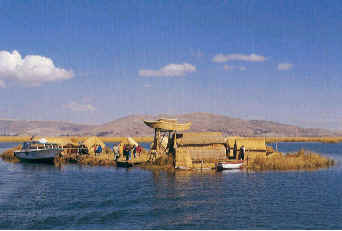 During our visit we will visit native families, schoolhouses, souvenir shops and can even ride in one of his little reed boats, then we will go in our boat to the island of Amantani, located at an altitude of 3.817 meters. Arriving at the island will taste typical local lunch, then we will go to the famous pre-Inca temples Pachamama and Pachatata , these temples are dedicated to the fertility of the land and ceremonial rituals are offered there. This island is inhabited by Quechua-speaking natives still ruled by their ancient traditions, whose main business is the production of ceramics and textiles. The positive energy of this island is so powerful that it is known as the "Island of Love."